Insects are Ready for Their Spring Comeback! Just like Arnold Schwarzenegger ominously declaring "I'll Be Back!" In the movie Terminator, insect problems that may have gone away in the winter are almost guaranteed to start coming back again in the spring, even after an especially harsh winter. For many pests, surviving cold weather is not at all a problem. Overwintering insects outdoors stay in protected places, such as cracks, crevices and other openings in the exterior of homes, and under bark, rocks, and debris on the ground. In the winter many insects go into a kind of hibernation that helps protect them, where fat content of their bodies increases and the amount of water decreases. Even more vital-their bodies start producing their own glycerol, which acts as a protective antifreeze in their blood. Many insects overwinter outdoors as eggs, which are often surprisingly cold resistant. But some insects survive the winter as larvae, pupae, or adults. Ant and bee colonies survive by clustering together to help regulate their temperature. Colonies of yellowjackets and wasp die off in most climates-the only ones that survive are impregnated females that start new colonies in the spring. Some insects overwinter far inside homes, in wall voids and other cracks and crevices. When warm weather arrives, these pests begin moving indoors, sometimes in large numbers, looking for a way out. Pests that spend the entire year indoors, like cockroaches and silverfish, can continues reproducing right through the winter, though they may be less active. Sometime very soon winged termites will start taking to the air to mate and start new colonies. Hundreds of these "swarmers" can emerge from a single mature termite colony. Being alert and watching for winged termites is important-it is both evidence that one or more established colonies are in the area, and a warning that they are trying to create new colonies. Swarmers are weak fliers and most stay within a block or two of where they emerged. A few may find their way indoors, but if you see many winged termites indoors it is a sign that they are probably coming from a colony that is already inside your home and eating away at it. We're including a picture here of a both a termite and an ant swarmer, because ants may swarm the same time as termites, and it is easy to mistake the two. Note that unlike ants, termite front and rear wings are about the same length, the wings have lots of veins, their waist is broad, and their antennae are curved or straight, never sharply bent. Proper identification is important, because the control techniques we use for termites, carpenter ants, and other ants are very different. Call us for a FREE professional inspection if you find any of these in or near your home. Save some of the pests for us in a jar for proper identification, but please don't fill the jar with water-it rots the insect sample. Whatever the pest, we will design the best control strategy to eliminate them and protect your home. Are poisonous spiders being imported in shipments of bananas and other international cargo? A recent study in the journal of Medical Entomology looked into this scary problem. The study found that spiders most often seen in bananas imported into this country are usually one of two harmless species, the pantropical huntsman spider, and the redfaced banana spider (see picture above).Spiders of medical importance in imported bananas are extremely rare. The only ones that come into this country are called Brazilian wandering spiders (also called banana spiders, or Phoneutria). These black, hairy spiders, and they can be large, with leg spans up to 2 1/2 inches wide. Their bites on very rare occasions have caused death in their native countries of Central and South America, but usually the bites cause only mild symptoms. And there have been no reports here of any being bitten by one of these spiders. There are many scares of Brazilian wandering coming into the U.S., but during the last 85 years there are only verified records of seven getting here from other countries-six of these were intercepted in bananas, and one in electrical parts. And what about famous Harry Belafonte song, "Day-O (The Banana Boat Song)", that talks about "the deadly black tarantual" hiding in bunches of bananas? Tarantulas are rare in bananas in the countries where they are grown. The song probably refers to Brazilian wandering spiders, not tarantulas at all. 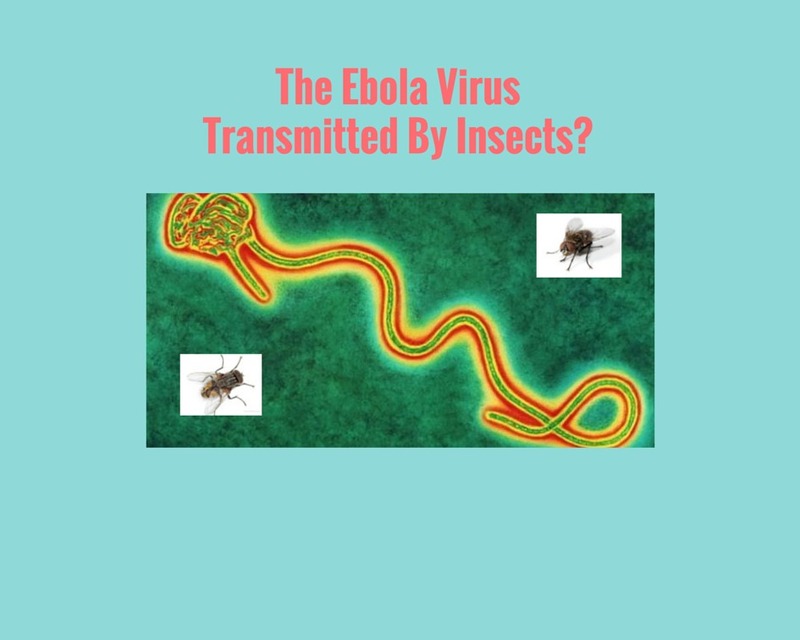 The Ebola Virus Transmitted By Insects? The Centers for Disease Control (CDC) believes that insects are not involved in transmission of the Ebola virus. While research shows that transmission form mosquitoes is inlikely, medical entomologist are concerned about insects like flies. Some species of flies, especially those in Africa, feed on eyes and open wounds of people. It is possible that these flies can mechanically transmit (not in their saliva or feces, but just their bodies) the virus. So we are still not sure if insects at times play a role in transmitting this deadly disease. It is well known that some people show no reaction to bed bug bites. Others may develop redness in the area bitten, or itching without the welts, or the characteristic itch red welts. The largest survey ever conducted about bed bug bites was recently published. The study found that people reported they were sensitive to mosquito bites were also more sensitive to bed bug bites. Arms and legs were areas of the body that were bitten the most, but people also reported bites on their chest or back, neck, hands, feet, and face. Bed bugs have a difficult time biting through most clothing, so bites tend to occur on exposed skin. Besides the bites, a number of people mentioned bed bugs cause sleeplessness, and others mentioned bed bugs causing emotional distress, anxiety, and stress. Bed bugs are not discovered until their population has grown, which may mean that the problem has spread into neighboring rooms or apartments. There are many reasons why they are not detected sooner-when so many people (30%) show no reaction to their bites, this complicates early detection. Plus, even with sensitive people, the first bites often produce no reaction-it is only subsequent bites that start producing reactions. Finally, reactions to bed bug bites seem to take longer than with other bites. For some reason the reaction to a bite sometimes is delayed for a week or so, and by that time most people have no idea where they were when bed bugs bit them. The number of serious foreign pests that are finding their way into this country has been rising in recent decades. It's not just happening here-due to increased globalization, this is happening all around the world. Although the spread of pests has been increasing, an interesting recent study has been able to document the spread of one serious pest 500 years ago, when sailing ships spread tropical fire ants throughout warmer areas of the world. Tropical fire ants, not to be confused with red imported fire ants, are native to our Southeastern states, as well as Mexico and down in South America. Spanish sailing ships during this time were establishing new trading routes. These routes carried goods from Mexico (Alcapulco), to the Philippines, and from there to Taiwan, and other areas of Asia and the world. By studying genetic diversity in tropical fire ants at these locations, it can be seen that these ants originated from Southwestern Mexico, where Acapulco is, and then were carried to the countries where the ships went. The habit of the ships was to fill their ballast with soil, then dump the soil when they reached their destination, and replace it with cargo. By doing this, they were unknowingly moving many pests to a areas of the world.